Went to the much awaited INOX today to see the movie "Cloudy with a chance of Meat Balls 2" in 3D scheduled for screening at 1.30 p.m. I arrived at the mall and parked the vehicle in the Basement. Unmindful of the Box office which is at the Ground floor, I started taking the escalator at all the floors. Suddenly, I recalled it and went on thinking that there would be a Box office outside the multiplex as well (I have seen such an arrangement in Fun Republic, Coimbatore). When I tried to enter the multiplex, the security (III party security service has been deployed) advised me to buy tickets from the BO at the ground floor. To add to my worries, the lift near the multiplex (5th floor) was not set to work. I had to go to the 4th floor to take the lift. I went below and took the ticket. Then I caught the lift and reached the 4th floor again and went to the multiplex at 1.05 p.m. I was told by the same guy that they would allow us inside only 10 mins prior to screening. At that time, a north Indian family (of tourists) arrived at the place and he inquired about Dhoom movie timings. He was also bothered about the temple timings and Fabric stores open timings since he had to visit it after the movie. Not sure how the information of the new multiplex reached the tourists so fast. It was 1.20 p.m and I was allowed inside. There were too many securities from the same agency and I refrained from photographing. There were 2 Indian snacks (Samosa, beverages, etc) counters, Act II popcorn stall, Icecreams stall, Sweet corn stall, etc. I went inside and saw the screen. It was really good inside and my movie began. The audio, visuals and 3D were really good. 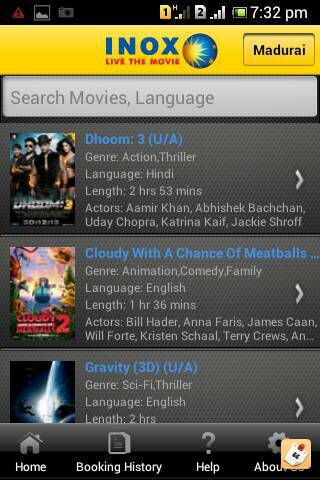 Inox added Madurai to their Android app. I bought some snacks and found that to be really tasty. Finally, after the movie was over, I took the exit and came out of the multiplex area. Overall, the impression it has made is good since I have never visited an INOX before. But I have been to Satyam, Escape, Thecinema@brookfields, etc. They should really think of adding some more BO counters near the multiplex, somewhere in the 4th floor. 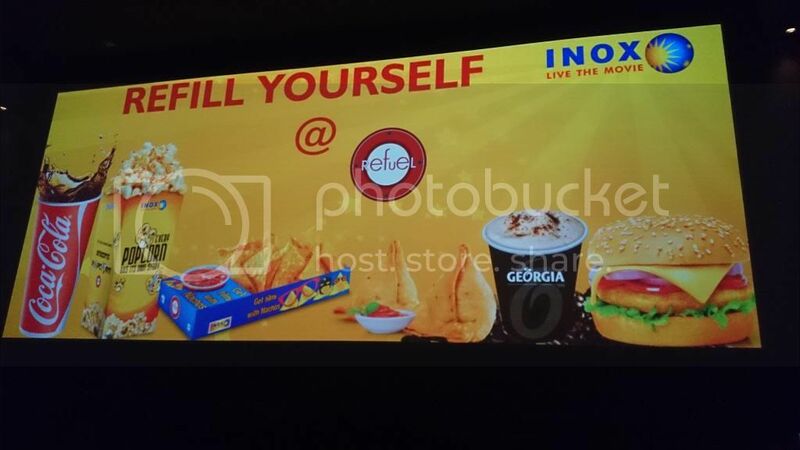 One laudable thing is that they do not collect deposit or anything of that kind for 3D glass which is being followed in Fun cinemas, Coimbatore. Since it was only 3 days since launch and the movie released only today, there were only 10 to 15 people there. I am sure the numbers would increase when Tamil movies are screened. One more thing is how their planning (of show timings) are going to be since the place is not so big, it would get crowded if 2 screens let intermission at the same time. Thanks to INOX to have taken the cinema viewing experience of Maduraiites to the next level. Lets hope the planned PVR Cinemas comes up in the Vascon project soon. Yesterday I had watched the movie Gravity 3D in Screen 2 (6:45 PM). Overall it was a nice experience. Like MK pointed out, how they going to handle the parking is a big question. Also they should have atleast one ticket counter and one self ticket Kiosk in food court (4th floor). seems a theatre named aarathi grand is opening. Somebody posted in SSC that it is in dindigul. Final theater list arrived. INOX not able to get both the new film for this Pongal. Resul Pookitty, an Academy Award Winner, is the "Sound Engineer" for Madurai Inox. Super. I felt the difference. Madurai inox screen5 is upgraded to silver screen like screen2 for projecting 3-D films. I cant ask each and every one to watch in Inox...its all about how wealthy you are...Because not all of us can afford so Big...but those guys who are "Rich" and "Upper middle class moviegoers" please do watch in Inox...This is my kind request...am in chennai studying here i cannot come to madurai...but i enforced and booked tickets for my dad mom and brother for Anjaan in Inox. Atlast made my dad to watch a movie after so long years This will be their first visit to Vishaal mall and Inox...i hope they will be surprised and baffled by vishaal mall as they are visiting for first time and hope they will be entertained in INOX with Anjaan.